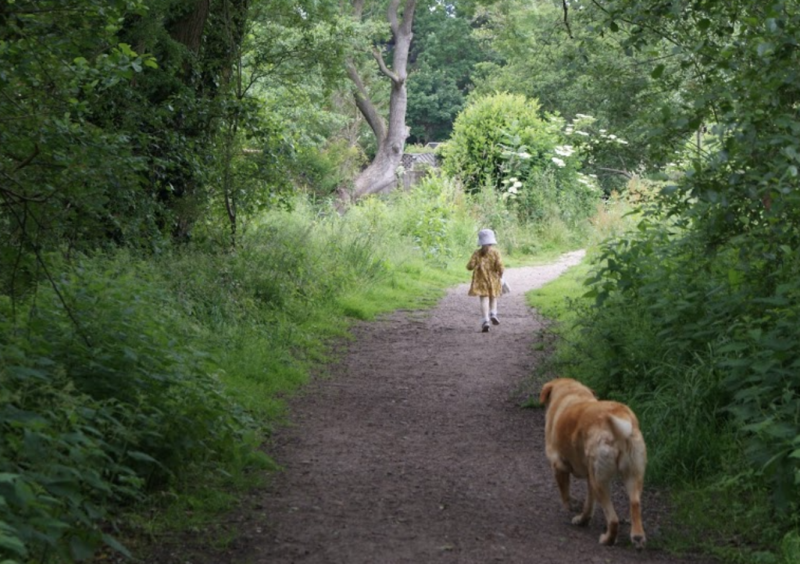 When Katrin asked me to write a list of my favourite family walks, I momentarily panicked. Since starting my Routes for Little Boots pages in September 2017, I’ve scaled much of Norfolk in my quest to find family-friendly walks and have been delighted to find there are absolutely loads! However, narrowing down a list is pretty hard, so we’ve decided to focus on Norwich and the surrounding area first and then we can always do another follow-up list for places further afield soon. 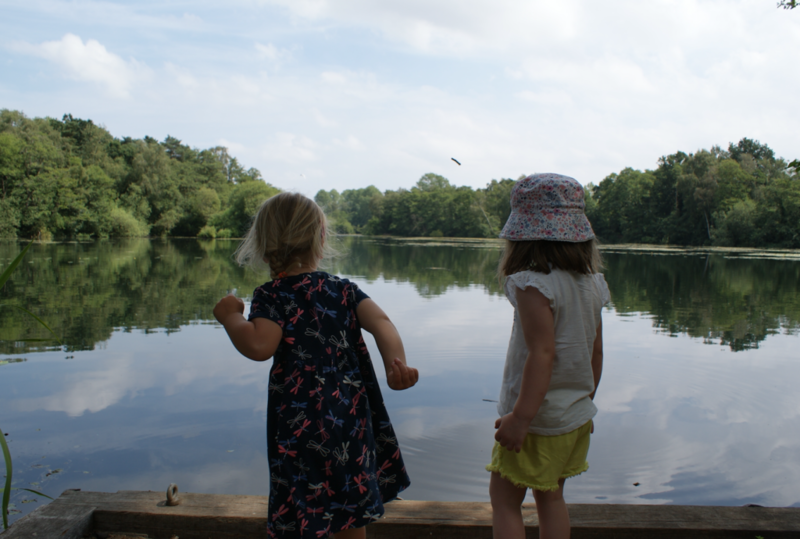 Taverham Mill is one of my favourite new places to visit. It has been open as a nature reserve for just a few years and is only a short drive out of Norwich. I’ve visited here in both the winter and summer and I thought the lakes were breathtaking on both occasions. It has two main walks: the red route is the longer and is dog-friendly – it loops round the whole site, starting alongside the River Wensum. The blue route takes you round the lakes and I can’t recommend it highly enough as the views are stunning. The kids love it! There’s a lovely little bridge for toddler pooh sticks and there’s a working weir at the start of the walk too. Both routes are accessible for pushchairs (if a tad bumpy in places) and the website says it is accessible for wheelchair users, with most of the nature trail being either low-level grass or boardwalk. The visitor centre has a gift shop and sells light refreshments. There are toilets with baby changing facilities and disabled-access toilets at the visitor centre. There is also a great play area. Parking is free but there’s an entry fee (Family tickets: £10, Adults: £3.50, Kids under 5 free); Dogs are welcome on the red route. I only recently found this and it’s also one of my new favourite places! The park has been carefully nurtured back into a wildlife haven by the parish council. It’s mainly grassland and flat so fine for pushchairs and I’m hopeful it will remain so in the winter. 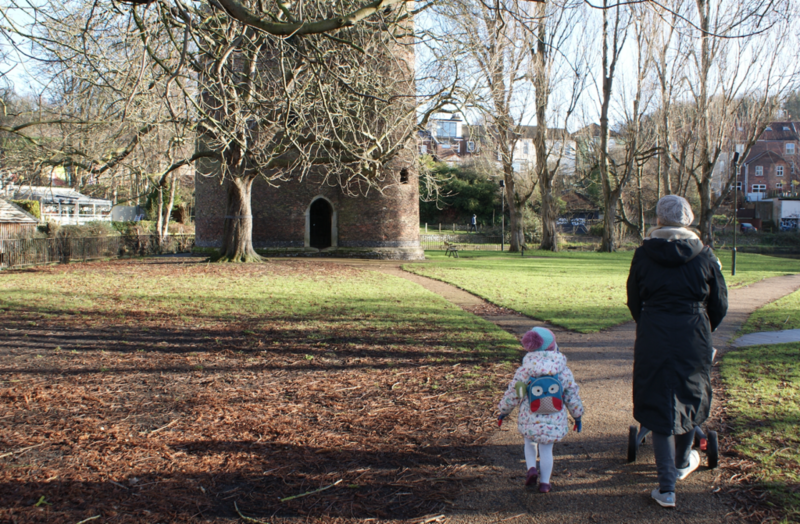 I reckon it’s about 1.5 miles round – my toddler walked all the way round, albeit with multiple stoppages for some of the lovely things on offer… picnic benches, wooden sculptures, trees to climb in and an old ice house that you can’t get inside but is great for echoes! 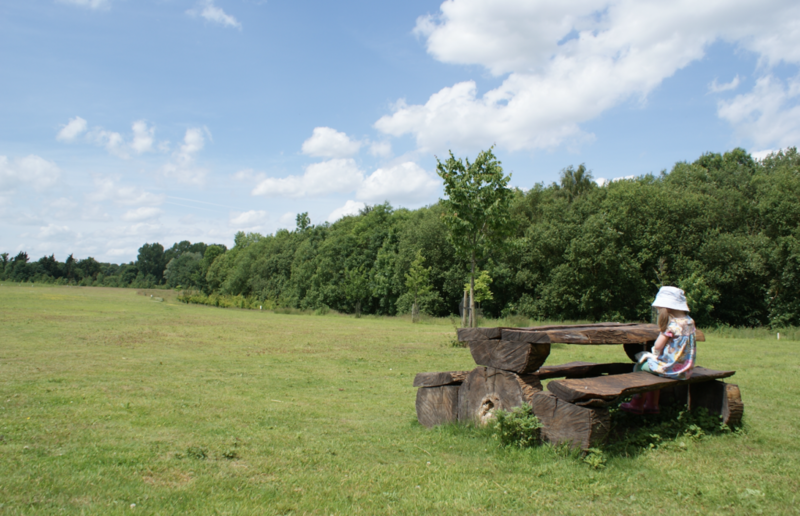 With the lovely weather we’re having this summer, I think it’s perfect for a picnic (there is a rustic picnic bench). There are no other facilities there (it does randomly have a recycling plant hidden away in the middle so watch the lorries) but it does have its own little car park. It’s dog friendly but they need to be on leads in spring and summer due to nesting wildlife. We loved it. Loads of nature and open space with great views. Parking is free and there’s no entry fee, but just to note there are no toilets. I only discovered this area a few years ago. It’s such a lovely walk with so many different routes to take off it, such as the Yare Valley Trail, Cringleford Woods and the walk through to Earlham Park. The lake is about a mile round. It’s a bit bumpy and can get a bit muddy after heavy rain, but we used to happily take our pushchair down there. Lots of places to stop and sit and there are picnic benches with BBQ stands and kids and dogs love the small bay area. The bridge half way round is one of the best in town for pooh sticks! When it’s a little drier, the Yare Valley Trail links up to Eaton (it comes out opposite Waitrose and there is a small car park there too), so we used to walk through to the Red Lion or Cellar House to make it a pub walk. From the UEA lake, the path is boarded for about half a mile but the latter stretch towards Eaton is a little less pushchair-friendly as the path is narrower in places and is definitely prone to mud squish. We assessed it as ‘pushchair tolerable’ in dry weather but I wouldn’t bother in the winter! 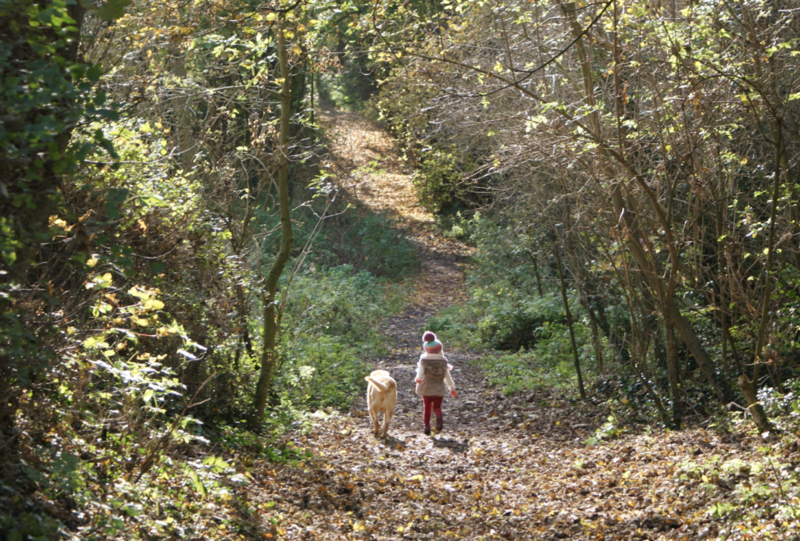 This is a beautiful, yet tiny, wood and is a fantastic short walk for toddlers. I last visited in autumn and it was stunning. As it is a woodland, in soggier times a pushchair might struggle, but during dry, summer months a pushchair will be able to handle it (although you’ll have to pull it up a short set of steps near the car park). The main draw for me was the fab play area across the common. It’s barely half a mile but I think that makes it a great option if you just need to get out of the house and stretch your legs! To extend the walk, you can also visit Marston Marsh which is just down the Marston-Eaton link path along the edge of Eaton Golf Course. This does have a kissing gate which means this bit is not really pushchair-friendly. Probably one that is better for toddlers or a baby carrier, but thought it was worth a mention. Parking is free at the small car park. There are no facilities as such, but it is close to the Holiday Inn and Marsh Harrier. It’s dog friendly apart from in the play area. This is a short but pretty walk by the River Wensum. We started at The Adam and Eve car park and headed towards the Jarrold Bridge and then turned right along the river path. The paths are hard surfaced, so really accessible for city pushchairs. Cow Tower is fabulous fodder for a toddler’s inquisitive nature so we spent a fair few minutes poking around! You can’t go far inside but can see through the iron gate. The route then bends round along the river, and we headed straight over Bishopsgate towards Pulls Ferry which is one of the sweetest spots in Norwich! We then walked up Ferry Lane to the Cathedral and had lunch. The Cathedral Refectory is a great place to stop and has baby change facilities and a great ambience. Parking at the Adam & Eve is Pay & Display (standard Council charges).